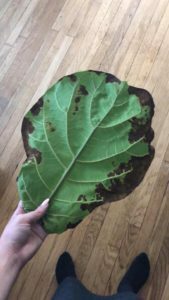 One of the most common concerns that fiddle leaf fig owners face is brown spots on the beautiful leaves of their plant. 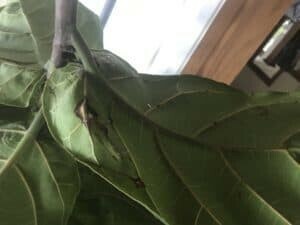 The condition can be frustrating and confusing because it takes a bit of experience to determine what is causing the brown spots on your fiddle leaf fig. It’s important to diagnose the problem quickly and treat your plant to help it fully recover. But how can you tell exactly what’s causing your brown spots? Is it dryness or overwatering? Too much sun or not enough light? 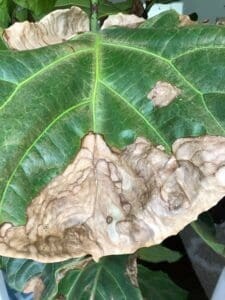 I’ve found that the best way to tell what’s causing your brown spots is to review several photos of the most common conditions to identify the problem with your plant. 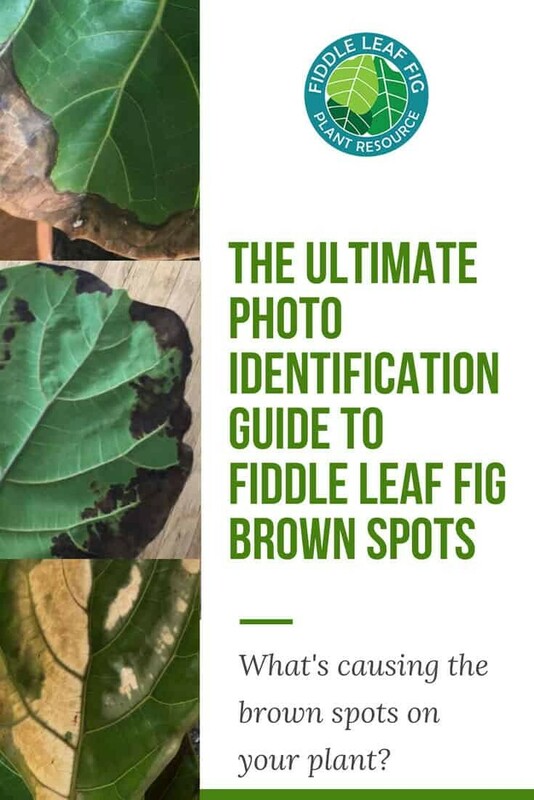 Here’s your definitive photo guide to brown spots in fiddle leaf figs! 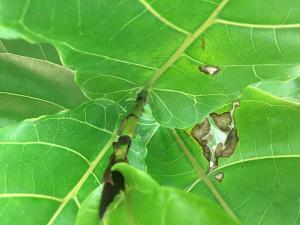 Arguably the most common cause of brown spots in a fiddle leaf fig is root rot from overwatering. Root rot is a fungal infection that takes place when the roots sit in water for too long and don’t have adequate drainage. 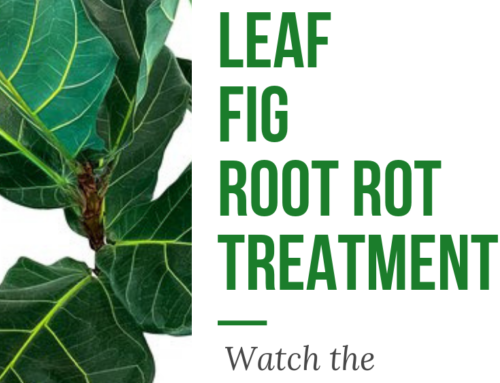 Fiddle leaf fig roots in particular need fast-draining soil and ample drainage. The telltale sign of root rot is very dark brown or black spots that spread throughout the leaf over days or weeks. 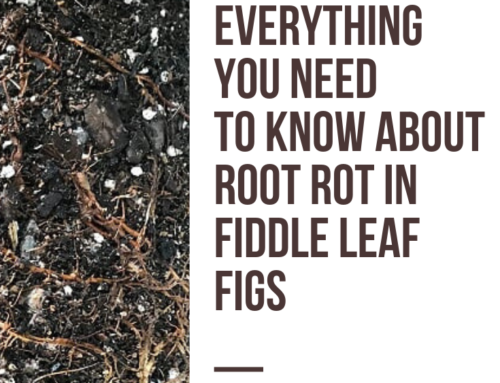 If you see dark brown spots at the base of your leaf, root rot is likely to blame. Brown spots from root rot typically cause the leaf to eventually fall off. 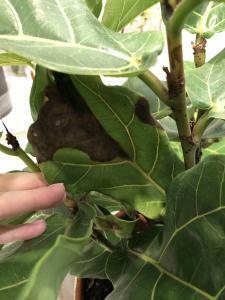 Here are some photos of classic brown spots from root rot in a fiddle leaf fig. 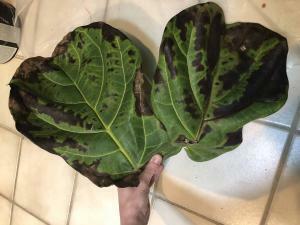 Classic dark brown spots on this dropped fiddle leaf fig leaf due to root rot. 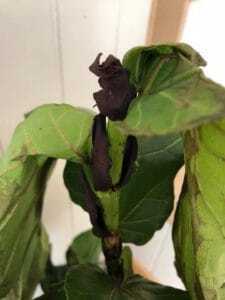 Brown spots on the bottom leaves of a fiddle leaf fig often indicate root rot. Spreading black or dark brown spots followed by leaf drop commonly indicate root rot. Black or brown spots spreading from the base of the leaf show root rot originating deep within the plant. 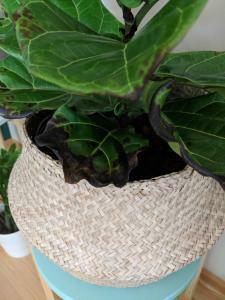 Bacterial infections in fiddle leaf figs can be very frustrating and hard to treat. The problem mimics the symptoms of brown spots from root rot, but is often more difficult to fix. In a bacterial infection, the brown spots will be lighter in color than from root rot, ranging from tan to dark brown. They are typically spots across the leaf, not necessarily at the edges or the base of the leaf, like with root rot. This condition can also cause your plant to drop leaves both at the bottom and top of the plant, whereas root rot is more likely to drop leaves at the bottom of the plant. Here are some photos of brown spots from bacterial infections. Brown spots from a bacterial infection are often lighter, ranging from tan to dark brown. Brown spots from a bacterial infection will affect all leaves throughout the plant equally. 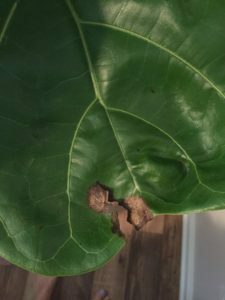 A bacterial infection can spread quickly and severely damage your fiddle leaf fig. Very dry fiddle leaf fig plants can quickly develop brown spots, which typically are more tan in color than brown and start at the edge of the leaf and spread inward. This can happen slowly or very rapidly on a hot day, like for this fiddle leaf fig below, which was left outdoors on a 110 degree day. 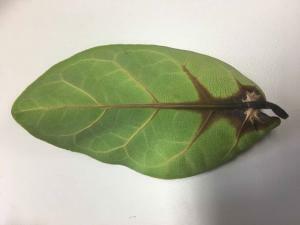 This leaf completed dried out in less than 12 hours. 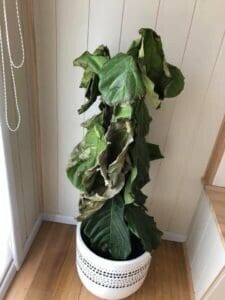 In the photo below the first, you can see a completely dry plant that was left without water for over two months when its owner went on vacation. A tell tale sign of dryness is the drooping of the leaves, which have lost their turgor pressure from lack of water. This leaf completely dried out while outside on a 110 degree day. 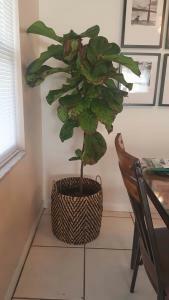 Very dry fiddle leaf fig plant after being neglected for over two months. In a very dry plant, the leaves will droop due to lack of turgor pressure. Brown spots on a new plant that show up a week or so after you move your plant are often from physical trauma. 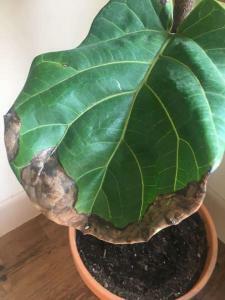 This is because the large leaves on a fiddle leaf fig are often damaged during a move and the bruises left of the plant will turn brown over time. Often, these spots look like cracks or tears. Brown spots from physical trauma are certainly a bummer, but they do not need treatment and your plant will generally recover very well. The tell-tale sign of these type of brown spots on an otherwise very healthy leaf and plant. Brown spots that show up a week or so after a move may be due to physical trauma. Cracks and brown spots resulting from physical trauma will appear on an otherwise healthy leaf. Cracks, holes, and brown spots can occur from bruising from physical trauma. If your plant gets too much direct sunlight, it can get a sunburn, which manifests as light brown spots that sometimes look bleached. These spots will be predominantly on the top leaves and can even show some red and yellow coloring, depending on how recent the burn is. The leaves should be removed by pruning and the plant should be relocated to a more protected location. Bleached or brown spots that occur on the top leaves of a plant may indicate sunburn. 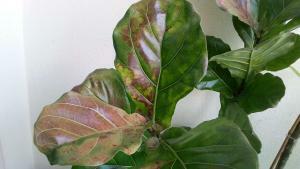 Sunburns in fiddle leaf fig plants can range from brown in color to red or yellow. A mild sunburn on a fiddle leaf fig leaf. 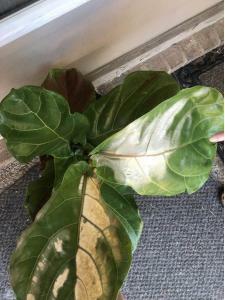 What Should You Do About Brown Spots on a Fiddle Leaf Fig? 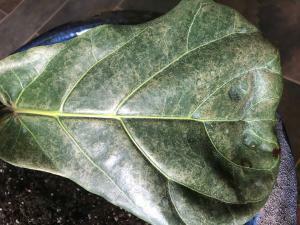 Once you’ve diagnosed the cause of your fiddle leaf fig plant’s brown spots, you’ll want to correct the issue in a hurry to help your plant make a full recovery. Correcting your watering problems, providing proper drainage, using a fast-draining soil, and making sure your plant is getting the right amount of sunlight will stop the brown spots and keep them from returning. Make sure you are fertilizing properly and checking the condition of your plant once a week to stay on top of any problems. Will the Damaged Leaves Repair Themselves? Unfortunately, damaged fiddle leaf fig leaves will not repair themselves. If the brown spots bother you, you can remove the entire leaf from the plant with clean, sharp pruning shears. Take care not to remove more than 10% of total leaves at once to avoid shocking your plant. Proper care is the only way to avoid brown spots in the future. If your plant is suffering from root rot, you may need to repot it into a container with better drainage and fast-draining potting soil. If a bacterial infection is to blame, correcting the watering conditions and waiting it out is your best bet. Very dry plants will recover after a good soaking and protection from too much heat. Physical trauma is the easiest condition to treat, as you just need to give your plant time and TLC to heal. Finally, sunburnt leaves will need to be removed and the plant should be protected from the sun. Learn more about how to treat and prevent root rot and watch a helpful video by clicking here. For more information on how to care for your fiddle leaf fig, join our newsletter and watch our free webinar now! 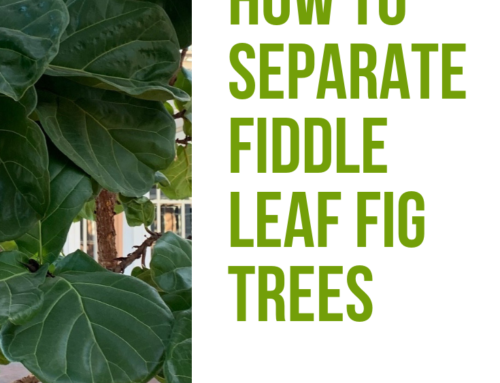 To learn even more, read The Fiddle Leaf Fig Expert, your complete guide to growing healthy fiddle leaf fig plants. The book is available in full-color paperback or Kindle edition on Amazon now!